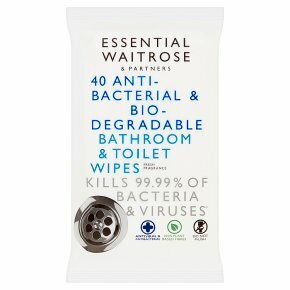 *Essential Waitrose bathroom and toilet wipes kill 99.9% bacteria including Listeria, E.coli, Salmonella, leaving your surfaces fresh, clean and sparkling. Dispersible wipes will break up when flushed to pass through your pipes and processing plant without blocking them. Suitable for toilet seats, toilet lid, cistern, basin and tap area, bath and shower area and tiles. INGREDIENTS: Aqua (water), Alcohol Denat., Benzalkonium Chloride, Sodium Citrate, Perfume, Isopropanol, Citric Acid, Denatonium Benzoate. Harmful to aquatic organisms with long lasting effects.If medical advice is needed, have product container or label at hand. Keep out of reach of children and pets. If in eyes: Rinse cautiously with water for several minutes. Remove contact lenses, if present and easy to do so. Continue rinsing. If eye irritation persists: get medical advice/attention. For use on hard, washable surfaces only. Check product suitability by first testing on a small, inconspicuous area. Not suitable for use with macerator toilets or septic tank systems. Do not use on carpet, upholstery or any type of fabric. Allow surfaces to dry before contact.